SVG’s inaugural Esports Production Forum took over the Sheraton Universal Hotel in Los Angeles yesterday to explore how videogame publishers, esports leagues and venues, and live-streaming outlets are bringing an entirely new mindset to live sports production. More than 380 attendees representing a cross-section of the sports-production industry joined the Forum to learn from esports-production leaders about the state of the industry and how they produce and distribute esports content for a rapidly growing fan base. It was standing-room-only at SVG’s Esports Production Forum in Los Angeles. As the fastest growing live-sports sector, esports has also emerged as one of the biggest drivers of technological innovation for live production. Throughout the day, the art and craft of producing esports for fans around the world — and the technology behind the production — was the focus for the standing-room-only crowd. 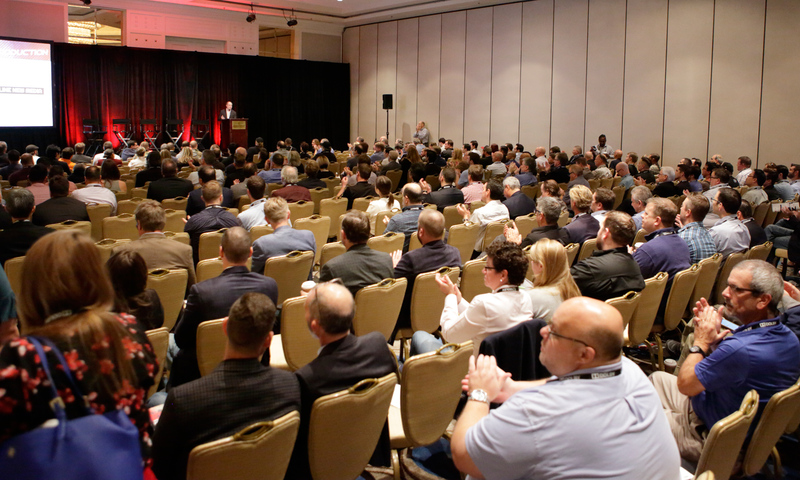 In addition to a full slate of panel discussions and case studies, the day featured three keynote conversations with industry leaders. Yvette Martinez-Rea, CEO/managing director, ESL North America, described her entry into the esports industry and reflected on the fanbase and athletes that make up this sector. “One of the fallacies about esports is that it’s one thing. It is not one thing,” she said. “It is more akin to track and field than it is to one sport: it is every game, every platform, every publisher. Start to multiply the different combinations, and it is enormously complicated. In the second keynote, Turner Sports VP, Esports Products and Technology, Robert Occhialini shared his own lessons learned in transitioning from more-traditional sports to esports. The day concluded with Drew Ohlmeyer, head of content, Allied Esports International, who discussed Las Vegas’s Esports Arena as well as his understanding of the passion and sense of community in the esports industry. The Esports Production Forum also featured an array of panel discussions: At the Front Bench: Inside Live Esports Productions; Remote Production: Safe at Home; Creating the Esports Arena Experience: A New Technology Frontier; Esports Technical Challenges: Asset Management, Postproduction, and Storage; and College and Amateur Perspectives: The Growing Role of Esports at Conferences, Universities, and Local Communities. The event kicked off with the presentation State of the Market: Understanding the Esports Revolution by Nielsen Esports Managing Director Nicole Pike. A series of case studies was presented: Esports in the Future: New Business Models and Technology Innovation (sponsored by Akamai); Esports Stadium Arlington Case Study: The Making of North America’s Largest, State-of-the-Art Esports Arena (sponsored by Canon); and Building an Esports and Gamer News Network (sponsored by Avid). SVG’s Esports Production Forum was made possible through the support of this year’s event sponsors: Title Sponsor Ross Video; Diamond Sponsors Grass Valley and The Switch; Gold Sponsors AJA Video Systems, Aspera, Calrec/DiGiCo, Camplex, Canon, Evertz, Marshall Electronics, NewTek, Riedel Communications, Shoflo, Swiftstack, and The Studio – B&H; and Event Sponsors Akamai, Avid, Dolby, OpenDrives, SOS Global Express, and TNDV. Check www.sportsvideo.org over the coming days for more in-depth reports, video interviews, full-panel audio recordings, photos, and more from the inaugural Esports Production Forum.